At 2:00 p.m. our neighbor Harold Parrott took us to Dulles Airport for a 5:30 flight to Munich. Cathy stood in line for quite awhile, and we watched several aluminum cases go through security bound for Nairobi, Kenya, site of a recent bombing of the U.S. Embassy. United Airlines was very helpful, and we got wheelchair assistance for Mom to get to our terminal. During our 8-hour flight Clyde schmoozed with the crew, who gave us a bottle of white German wine and a bottle of champagne as we left the plane. We arrived in Munich around 8:00 a.m. (there is a 6-hour time difference), where we were met by a very friendly Lufthansa Airlines employee with a wheelchair for Mom. She took us through Customs and allowed us to stay in the Special Services/employee lounge for our 3-hour layover. There we were served water and sandwiches, and Mom took a short nap. We were supposed to leave Munich at 11:00, but there was a delay of about an hour. Finally at about noon we took off for Barcelona. During the 2-hour flight Clyde had an opportunity to practice his Spanish since he was sitting among a group of people from Catalonia who were returning from a vacation in the U.S. 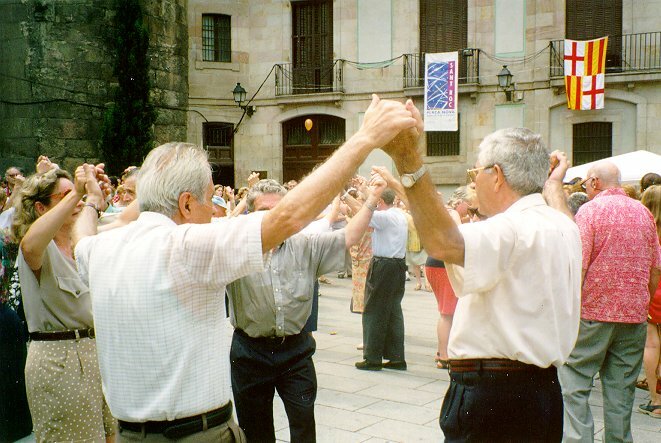 They advised him on places to see in Barcelona; he gave them his bottle of champagne. In Barcelona, we were again met by a Lufthansa employee with a wheelchair who helped us find the baggage claim area and took us to a taxi. Around 3:30 we arrived at the Avenida Palace Hotel, a very pretty, small hotel with very large room keys. We checked in with the Orient Lines cruise representative & proceeded to our rooms. After short naps we were ready to paint the town! We sauntered across the street to a deli cafe, La Tramoia. When the waiter realized we weren't speaking Spanish, he gave us two special menus -- one in English and one in French! We asked for a selection of tapas, which were delicious but I'm not sure what we were eating; shrimp, anchovies and smoked salmon were the only foods we recognized. Mom ordered Croque Monsieur, which turned out to be a ham & cheese sandwich, minus the cheese due to a miscommunication with the waiter about blue cheese, which Mom can't eat. We decided to forego the optional flamenco dinner & tour offered by the cruise line and order a taxi for our own special tour. 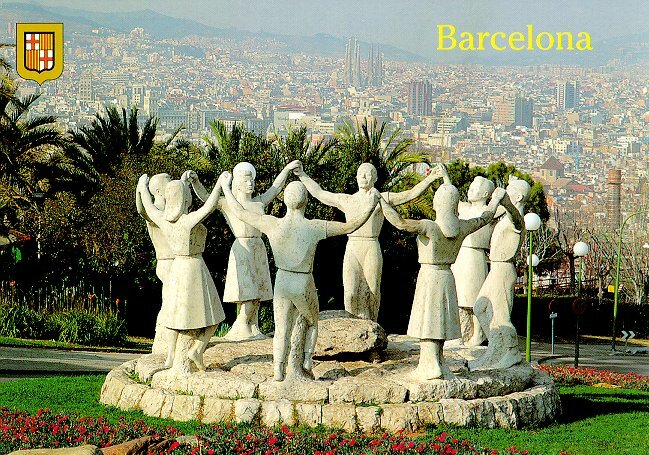 Our cab driver spoke only Catalan, the language of the region of Catalonia which surrounds Barcelona. Since Catalan is similar to Spanish, Clyde was able to be our translator for our impromptu tour of the city. We were struck by the beauty of Barcelona; many of the buildings had wrought-iron grillwork on balconies that reminded us of the French Quarter in New Orleans. After a ride along Las Ramblas, a boulevard with lots of street vendors, artists and mimes, our first visit was to Montjuic, known as the "magic mountain." It is a large city park on a mountain overlooking the city. We stopped at Montjuic Castle, which was built in the 17th Century and was occupied by the dictator Franco during the Spanish Civil War. (Home rule was re-established after his death in 1976.) We also drove by two buildings -- Casa Mila and Casa Batilo -- designed by the Catalan architect Gaudi in the early 1900s. They are very surreal looking! He apparently liked to design buildings incorporating elements of nature like waves and animals. 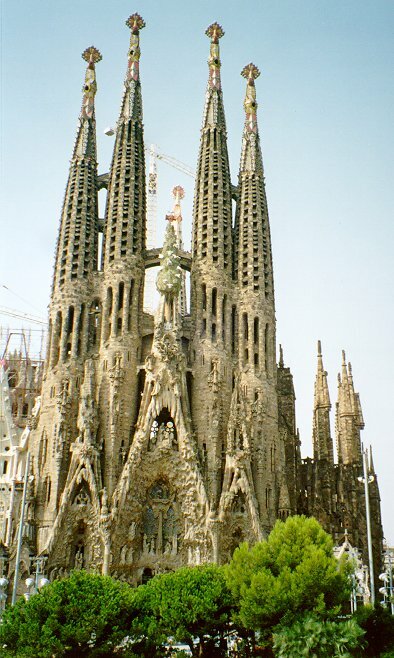 Our last stop was the Sagrada Familia, a cathedral begun in 1882 and also designed by Gaudi. Eight spires are completed, representing 8 of the 12 apostles. Ten more spires are planned, and it's estimated it will take another 60 years to finish. 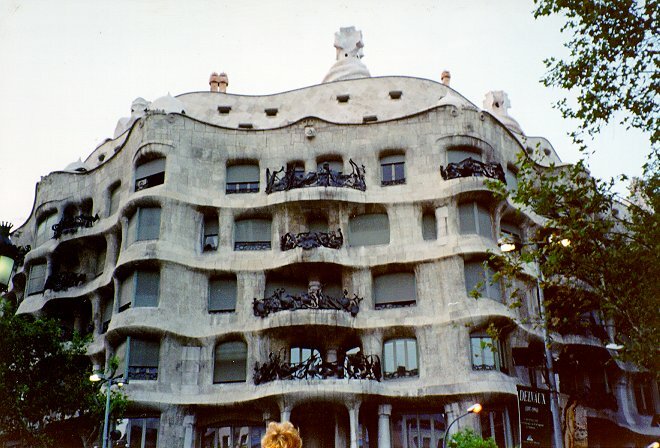 Gaudi was killed in the midst of his work, and his designs for the remainder of the building were very sketchy, so the newer parts are very different in style. After a buffet breakfast at the hotel, we got on a tour bus for a tour of the city organized by the cruise company. We saw the statue of Columbus, pointing not west toward America but south toward the port. 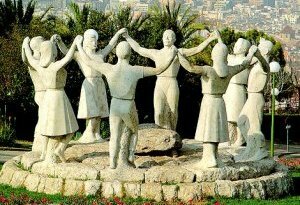 We made another trip up Montjuic Mountain, but this time we stopped at the Olympic Stadium, site of the 1992 Olympics, and a park where we photographed a famous statue of children dancing the circle dance which is characteristic of the Catalonian people. We drove past the Gaudi houses again and stopped for a short time at the Sagrada Familia. Thus far it has no roof, so our guide described it as a monument rather than a church, although there is a small basement chapel on the grounds. We drove down Las Ramblas again and then to the Barcelona Cathedral, where we stopped to walk around. In the square outside the cathedral we saw a demonstration of the circle dance; it was a very hot day, so the dancers looked very warm. We were then driven to the waterfront area where we stopped for a delicious lunch of seafood paella and fried prawns. Around 3:00 we were driven to the Marco Polo. We boarded, found our cabins and took a nap (jet lag!) before dinner at 6:30. Mom's cabin is on the Main Deck and we're a deck below in an outside cabin. Around 6:00 the ship left port. After dinner and a short talk on tours available, Cathy crashed and Clyde & Mom went to the evening show at 10:30. Cathy was up early to attend the exercise class in the Health Club at 8:00, so we had room service breakfast. While she returned to shower and dress, Clyde and Mom went to the dining room breakfast. There was another tour lecture in the morning, after which we sat on the Promenade Deck to watch the water go by. We were traveling near the coast of France, so we could see lots of beautiful homes and hotels along the shore. We anchored off the coast of Monaco before lunch, and at 2:00 we traveled by tender to Monte Carlo for an impromptu 1-hour taxi tour of the city. The driver spoke French, so Clyde was again our translator. We stopped for photos at the Palais de Prince (Prince Ranier's palace), and the huge, ornate casino. We also got to see the city streets where the Grande Prix is run -- 72 laps around the city at 100 mph! Back on board the Marco Polo, we attended the afternoon tea and met some nice people from Clarinda, Iowa who now live in Sun City, Arizona. We all played Trivia. At dinner a couple from New Zealand joined us. Mom & Clyde attended the evening show and Cathy retired early. Back at Barberini Plaza, we ate a quick lunch at McDonald's. Then our bus took us to the Vatican City, a 13-1/2-acre compound surrounded by a tall wall of stones that slants inward at the top. Inside the wall is St. Peter's Square (Piazza San Pietro), a huge square in front of St. Peter's Basilica where the Pope appears for Mass. 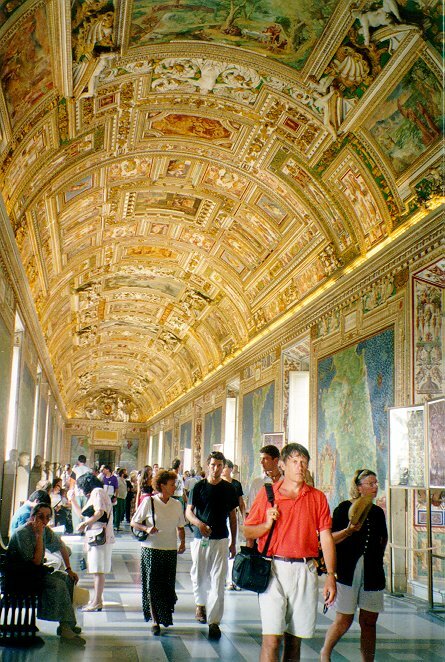 Our tour guide first took us through some of the Vatican museums as we walked toward the Sistine Chapel. We saw some Egyptian mummies and sarcophagi, enormous tapestries, and oodles of Greek and Roman statues. We were amazed that none of the museums were air conditioned. It was very hot, and the windows were open, allowing the heat, humidity and city dust to settle in on the art works. Finally we arrived at the Chapel, which is still being restored. 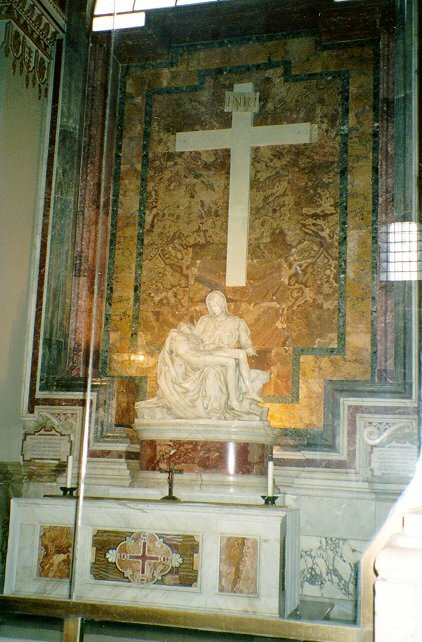 It was devoid of furnishings except for benches around the perimeter and a crucifix at the altar on one wall. 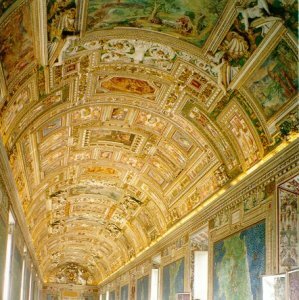 The paintings on the ceiling by Michelangelo were breathtaking, and there were paintings by other artists on the walls. Even the bottom half of the walls were painted to represent draperies. 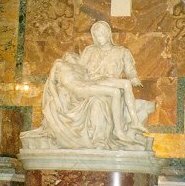 We had a little free time before the bus was to return to the ship, so we walked to St. Peter's Basilica, where we saw Michelangelo's Pieta. It was in a corner of the church, surrounded by bullet-proof glass. The vaulted ceiling was designed by Michelangelo in the 1500s. There were lots of enormous statues, marble columns, paintings -- an awesome sight! We met our tour guide in St. Peter's Square. The square is bounded by two semi-circular colonnades, each made up of two rows of Doric columns. There is an obelisk in the middle of the square and statues of Peter and Paul in front of the Basilica. The guide pointed out the balcony outside the Pope's residence and the balcony in St. Peter's Basilica from which he conducts Mass. It was interesting to imagine the entire square filled with people attending Mass. On the way back to the ship we observed more of the city. My impressions are of narrow streets, darkened buildings (from pollution), graffiti on walls, fruit stands, and lots of small cars and motorbikes. 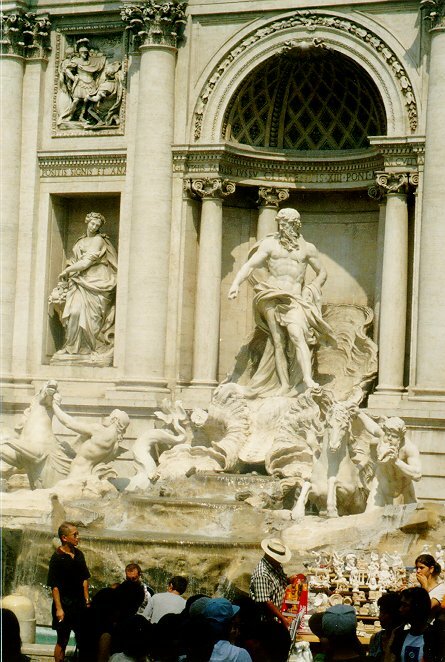 There is a great deal of "sprucing up" going on to prepare the city for a once-every-25-year pilgrimage in 2000. Outside the city we saw fields, rolling hills and lots of trees; the countryside reminds me of Virginia. It was a very long, very hot day, but we thoroughly enjoyed our tour. After a delicious dinner on the ship, we hit the sack early. We met early today for a tender ride from the ship to the town of Sorrento, Italy. 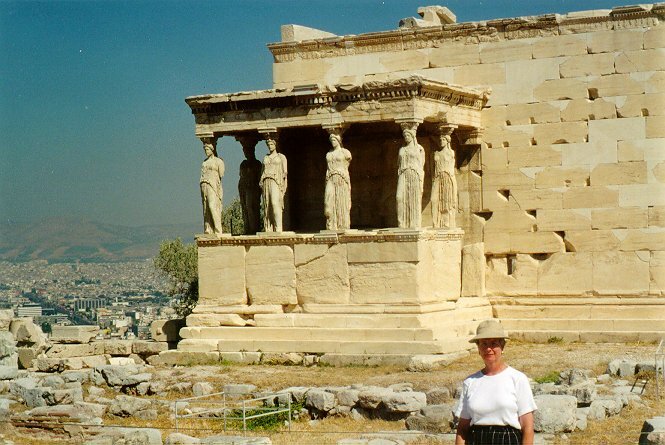 To the ancient Greeks, this area was known as the Temple of the Sirens. It is a beautiful resort town that overlooks the Bay of Naples. Access to the town is by steep stairs or a road with hairpin turns. We were bused up the hill and then to the archeological site of the city of Pompeii. Along the way we saw olive and lemon trees, often planted in groves together. The lemon trees are protected by black netting to keep the wind from causing the lemons to bump into each other and get bruised. Pompeii was buried by an eruption of Mount Vesuvius in 79 AD. About 3/4 of the city has been excavated. We saw shops, houses, a public bath, and the Forum, which was surrounded by a basilica and the temples of Apollo and Jupiter. It was a very hot day, so we took our time and rested alot along the walk through the dig. There were plaster casts of two people who had been killed by the poisonous gases after the volcanic eruption. Archaeologists made the casts by pouring plaster into holes in the pumice and ash as they were excavating the site. Our bus took us back to Sorrento and we took the tender back to the ship in time for a late lunch. We all took naps in the afternoon and attended the Captain's reception and dinner in the evening. 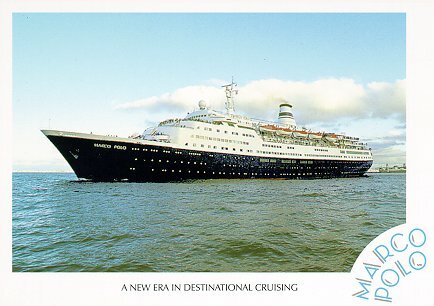 The captain told us the Marco Polo was formerly a Russian ship, the Alexander Pushkin, that traveled from Leningrad to New York to Canada. (We later hear rumors that it was a spy ship!) It holds about 850 passengers and about 350 crew members. The people on this cruise were from 19 different countries. The ship left Sorrento around dinnertime, so we got to look out and see the Isle of Capri as we dined. It is mostly white, craggy rock, with beautiful beaches and clusters of houses here and there. After dinner we caught up on our travel logs and attended the evening show, then danced in the Charleston Club and walked around the upper deck in the dark. We spent a leisurely morning reading (Cathy), watching Bingo (Mom) and getting a haircut (Clyde). After lunch the ship docked at Valletta on the island of Malta, and we hired a cab for two hours to take us to see the sights. The cab driver spoke Italian and we didn't, so conversation was minimal, but we got to see quite a bit, even if we weren't quite sure what it was. Evelene Cruze, a schoolteacher from Los Angeles, rode with us. Our driver first took us to the city of Mdina, known as the "Silent City" because there were few people on the streets (except for tourists). The town is inhabited by the Maltese nobility. Some of the old mansions date from the Middle Ages. We took a photo of the Cathedral of Sts. Peter and Paul, built in 1702. Then our taxi took us to the Ta 'Qali Handicrafts Center, basically a tourist trap. There Cathy bought a filigree thimble for Mom's collection (decorated with the Maltese cross, typical motif in the area) and Clyde chatted with an artisan who makes filigree jewelry and his son, who is in training. We then drove back to Valletta, viewing lots of cacti along the way. Our driver stopped at the Grand Master's Palace, the former residence of the Grand Masters of the Order of St. John (Crusaders) which was completed in 1574. We also toured St. John's Co-Cathedral, which was finished in 1577 and was the church of the Knights of the Order of St. John. The interior was baroque, with much inlaid marble. Our last stop was Upper Barracca Gardens, where we looked over all the old forts in the Malta harbor. Back at the ship, we were just in time for tea and Trivia. There were two teams and we came in second in a playoff, but we won Orient Lines address books anyway. No sightseeing tours today, so we all slept in and ate breakfast in the Raffles Restaurant. There was a disembarkation talk in the morning. After lunch we watched Bingo, played Trivia again (and won, thanks to the comedian Jerry Vernon who played on our team). After dinner we went to the early evening show and retired early. 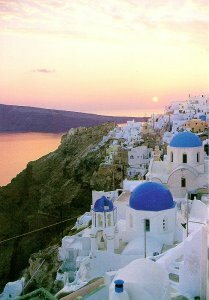 Clyde and Cathy were up early again today for a tour of the Greek island Santorini, named for the island's patron saint Irene. A volcanic eruption around 1500 BC buried the island in pumice and transformed the shape of the island from round to crescent-shaped. From the port town of Fira, located on a cliff overlooking the sea, we were bused to the town of Akrotiri, the site of an archeological dig which began in 1967. On the way, we saw grapes, pistachios and tomatoes growing in fields of black ash and beautiful little houses and churches built from concrete block covered with white stucco. Typically, each building had a domed area and blue doors and trim. No grassy lawns, though! Akrotiri was believed to be inhabited by Minoans at the time of the volcanic eruption. Some think it could be the site of the lost city of Atlantis. No bodies have been uncovered, so historians think the inhabitants escaped before the eruption. Apparently the Minoans had a seafaring culture, with ships made from cypress trees -- interesting, because there are now few trees on the island. Under a roofed dig area, we observed the 3% of the town that has currently been uncovered. We saw lots of pottery, and the remains of walls of houses and shops. The whole site seems to be very fragile. Clyde noticed that where walls have been excavated on one side only, the weight of the debris on the other side tends to push the walls outward. Our bus took us back to Fira, where we walked around and shopped for about an hour. Along the main street on the sea side were doors projecting above the stone wall at the edge of the cliff. At first we thought they were billboards of some sort, but as we approached them, we noticed the small of garlic. Pretty soon, someone went through one of the doors and down some steps to a restaurant perched on the side of the cliff — one of several similar restaurants! While in Fira, we looked at some handmade silver punch bowls that ranged in price from $1500 to $10,000, Cathy bought a linen table runner and two placemats embroidered with flowers and the meander pattern (symbolic of the meandering rivers of Greece) which is common in the arts and crafts of Greece, and Cathy took a photo of Clyde with a pistachio vendor and his donkey. After a hair-raising ride 1000 feet down the side of the cliff on the funicular we walked to the tender which took us back to the Marco Polo in time for lunch. Some people rode down the mountain on donkeys on paved zig-zagging paths. After a buffet breakfast we spent a couple of hours being processed off the ship. 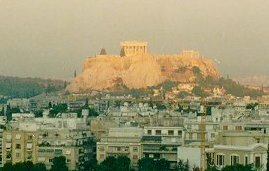 We then were bused from the port of Piraeus to Athens, Greece for a brief city tour (to keep us occupied until our hotel rooms were ready). Clyde and Cathy took the walking tour of the Acropolis, a rather grueling trip up a hill at temperatures of about 100 degrees. At the top, there were huge marble steps, very slippery and uneven, and mobs of tourists -- and no water anywhere. We saw the Theatre of Herodis (an amphitheater where sound and light shows are held each night), the Propylaea (an entrance across the western front of the Acropolis designed to keep people from seeing the Parthenon until they got to the top of the hill), the Erechtheion (with statues of six Caryatids, maidens, as columns supporting the portico), and the Parthenon -- all built around 400 BC! 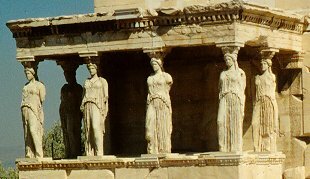 The Erechtheion is named after Erichthonius, the mythical king of Athens, and it stands on the spot where the mythical gods Athena and Poseidon fought for possession of Athens. We also toured the Acropolis Museum, which contains statues and reliefs taken from the site. 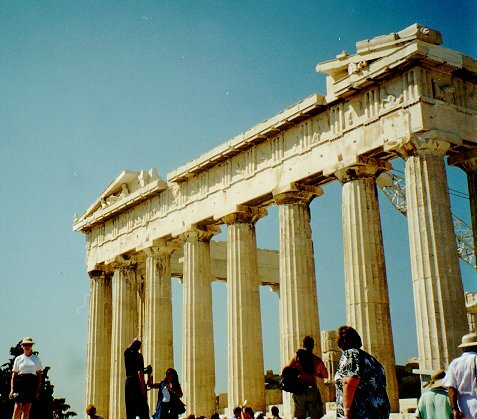 From the Acropolis, our bus took us past the Corinthian Temple of Olympian Zeus, through Constitution Square to the former Royal Palace where costumed Evzones stand watch over the Tomb of the Unknown Soldier. We also drove by the Olympic Stadium, built in 1895 for the first modern Olympic Games. We finally arrived at the Athens Hilton around noon and checked in. 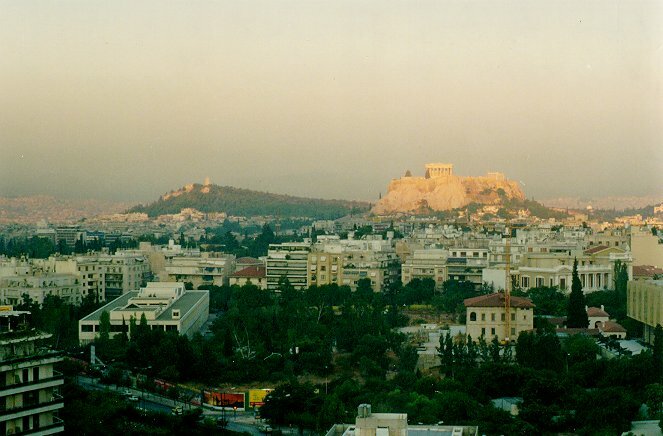 Cathy and Clyde's room was on the 12th floor and we had a great view of the Acropolis. After a briefing by Orient Lines at 1:30, Clyde went in search of restaurants for lunch. (The Hilton had only one choice -- a buffet that cost about $20 per person.) We wound up eating at Goody's behind the Hilton. We were all tired so we took naps. In the evening we checked out the beautiful restaurant on the top floor of the Hilton with a view of the city on both sides; however, we didn’t want to spend $45 per person for the one-price dinner, so walked to another restaurant behind the Hilton and had Greek salad and pizza. Clyde went scouting early this morning for something for breakfast. (We wanted to avoid the one-price $20 breakfast buffet at the Hilton.) Although nothing was open at 6:30, he was able to find a shopkeeper willing to sell him some juice and croissants even though the shop wasn't open yet. We all ate in our room and then met our group for a trip by bus to Delphi. The trip took about two hours and we saw beautiful countryside along the way. There were rolling hills with truck farms and people harvesting watermelon, small shrines with votive candles along the road, and, as we traveled farther north, mountains. The landscape reminded us of both Virginia and the California coast. Delphi is built on the slopes of Mt. Parnassos overlooking the Gulf of Corinth. 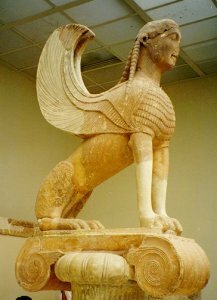 The ancients regarded Delphi as the navel of the world. 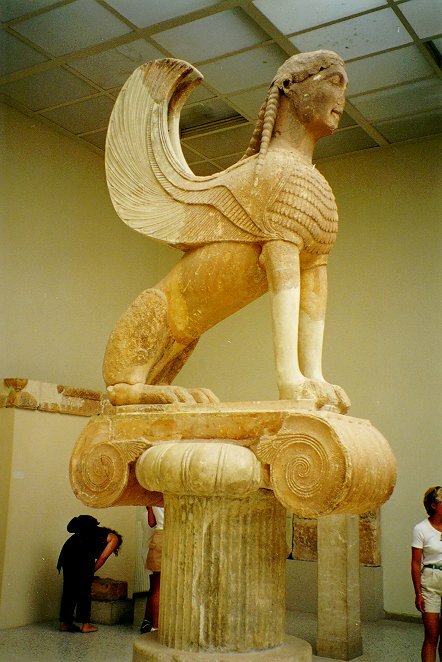 According to mythology, Zeus released two eagles at opposite ends of the world and they met at Delphi. 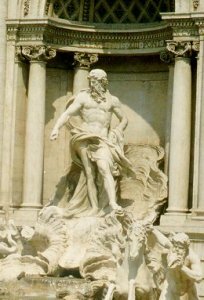 The city was dedicated to the god Apollo. 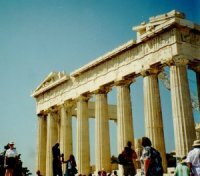 Pilgrims from Athens, Sparta and other cities went there bearing gifts to ask the advice of the Delphi oracle, believed to be Apollo's mouthpiece. The oracle was a priestess over 50 years old who sat on a tripod at the center of a chasm in the Temple of Apollo. Vaporous fumes came out of the chasm. The priestess chewed on laurel leaves and went into a frenzy, uttering seemingly unintelligible phrases which were translated by a priest. Different priests interpreted differently, depending on their own agendas, so the advice could be somewhat contradictory. On the Sacred Way leading up to the temple there were shops where offerings were sold and treasuries built to store the offerings of particular cities. On a wall which surrounded the area of the temple there were etchings documenting the release of slaves. Higher on the hill there was a stadium, but it was so hot (and again, no water) that we decided not to climb up to see it. Our tour guide took us through a museum where artifacts from the Delphi ruins were displayed. We were then transported to the Chalet Maniatis Restaurant for a lunch of spinach pie, baked veal, Greek salad and baklava. The view from the top of the mountain as we began our trip back to Athens was magnificent! That evening we were picked up at the hotel by the father of a jewelry store owner for a private viewing of some of their jewelry. Cathy bought two gold necklaces, one with the characteristic meander pattern, as souvenirs of our trip. We ate at Scape Restaurant near the hotel and packed for our return home. We had to have our bags outside our door by 5:15 a.m. after a 5:00 wakeup call. We ate leftover rolls from last night's dinner, and Orient offered free coffee in the restaurant before we were bused to the Athens Airport. It was a rather chaotic place but after more than an hour standing in line we finally got on board our Lufthansa plane for our 8:30 flight to Munich. In Munich we had a short layover and then a 10-hour flight to Dulles. The flight was uneventful but long! We were whisked through Customs (Mom in a wheelchair), we caught a taxi and were home by 6:00 p.m., after 17 hours of traveling. This was truly the trip of a lifetime. We got to see many places we'd heard about and studied over the years. It was a great learning experience! Even so, it was wonderful to get back to Virginia. The green grass, trees, and clean, wide streets were a welcome sight!